2011 was a long and cool growing season without the extreme daytime heat the South Okanagan is known for. This resulted in grapes that achieved full phenolic ripeness at record low sugar levels (and thus low alcohol levels). South Okanagan had an amazing fall with mild weather which gave us the luxury of a seven week long picking window. 2011 goes into the history book as an atypical, yet very welcome vintage. The 2011 Syrah is comprised of fruit grown in all four sub appellations in the South Okanagan Valley. A traditionally made Syrah in that sense, as the sum is considered greater than the parts (lieux-dits trumping single cru ala Chez Jamet, JL Chave, Clape). The resulting effort is a very complex wine with medium garnet colour. Despite the relative youth of the vines the finished wine continues to surprise us and captivate our imagination from vineyard to bottle. While it combines elements of both the old and new world, our Syrah leans more toward what you would expect from France’s Rhone Valley – hence the name. The wine is nuanced, elegant and refined. Black peppercorn, game meat, a mélange of wild berries, bacon and smoke form the aromatic and flavour profiles of this wine. There is something more perfumed and high toned about the 2011 vintage that marks the uniqueness of the 2011 growing season. Centuries ago the black pepper spice trade launched voyages, wars and epic tales; today we suggest trying a black pepper crusted New York Steak paired with our Syrah to fill the air with peppery aromas. Le Vieux Pin winemaker Severine Pinte is putting her stamp on the south Okanagan winery’s and ironically means she is doing as little as possible. The LVP syrah is a good example of a wine that reflects its site. Cool brooding, peppery, smoky this is classic south Okanagan syrah. The attack full and meaty with black fruit, licorice and smoky bacon. Very northern Rhone you can drink this now but I would give it another two to three years in bottle. A terrific effort tin a challenging year in the vineyard. Steak anyone? The 2011 Syrah is so very young and even a couple hours in the decanter did little to put a dent in it’s youthful reluctance borne from the cooler than usual growing season. Because of this, it’s not as forward and bold as the ’08 vintage, though it’s easy to see the potential of what it’ll be about 2-4 years down the line. The nose is subtle, with black pepper, black berries, and a touch of black – yes, black again – liquorice, with a very subtle floral component. The forest berries continue through to the palate with an intriguing complexity, creating a refined balance with the French oak. There’s spice and pepper on the finish. The tannins provide for a firm backbone. The wine has great structure, making the 2011 vintage a keeper, and one for the cellar. It’ll be worth the wait. The nose of this Northern-Rhone inspired Syrah is divine, with layers of white pepper, violet flowers, cured meat, vanilla-cola and black cherry aromas producing a heavenly, feminine bouquet that you will want to quaff for hours. The palate is a little more grounded on Earth with cool vintage intensity and body, offering a flavour profile of pepper, cherry, field berry, vanilla and oak. A touch of grapefruit acidity edges the balance towards sour on the long, spicy finish. Drink 2014-2018. This has all the spice and crackle that fans of northern Rhone syrah admire – the pepper, smoked meat, dried herbs – with some oak chocolate. But in this cool Okanagan vintage the flesh is lacking and the acidity is a just a bit tart. Still, they have eked impressive flavour concentration and authenticity out of the fruit, and the length is very good to excellent. Best 2015 to 2019. Dark ruby in colour, the 2011 Syrah reveals subdued aromas of gentle peppery plums, cherries, licorice, forest floor, and spice. Complex, retaining good fruit, firm tannins, balanced acidity, and a neat hint of plums and peppery nuances on the finish. Ideal fruit orientation and balance, though hopelessly overpriced (at least in my estimation). Now-2016++. 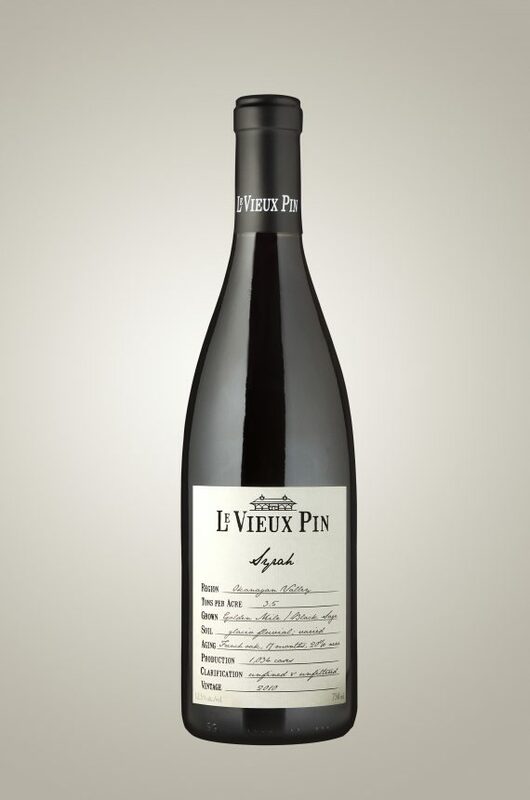 For release in the spring of 2014, this is an elegant Rhone-style red with only 12.7% of alcohol. The wine begins with aromas of white pepper and floral berry aromas. On the palate, there are flavours of cherry and blackberry. The wine is medium-bodied but the flavours are ripe.